2010 has brought another titanium and stainless steel masterpiece for the well-known luxury brand Vacheron Constantine, the Overseas Dual Time watch. The Overseas collection has been a popular one for the brand since the launch of the first version in 1996. A beautiful watch with great functionality for travelers and collectors alike, the model offers two time zones, a day/night indicator, a power reserve complication, and a date display. Pricing for this watch is expected to be about $15,000-$17,000 (USD) when it becomes available later this year. The Overseas Dual Time case is 42 millimeters in diameter crafted in stainless steel with a titanium bezel. The push-piece is protected with a titanium guard. The solid case-back has been stamped with the "Overseas" medallion has been secured with screw fastening. The superior case construction guarantees an impressive Water resistance that has been tested at a pressure of 15 Bar, equivalent to 150 meters. The slate-grey dial has a circular satin-brushed finish with a painted outer minute circle and 12 applied hour-markers in 18-carat gold highlighted with a white luminescent substance. The watch comes with a hand-sewn dark grey square-scale alligator leather strap and an additional strap in black rubber. The watch is secured to your wrist with a double-safety triple-blade folding clasp in stainless steel. The watch is powered by the mechanical self-winding movement caliber 1222 SC. The movement is protected by an antimagnetic screen and measures 4.85 millimeters thick and 26.60 millimeters wide. It contains no less than 34 jewels and beats at a frequency of 28,800 vibrations/hour. The movement allows for a power reserve of approximately 40 hours. 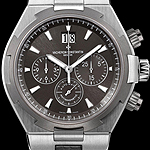 The reference number for the Vacheron Constantin Overseas Dual Time Steel & Titanium is 47450/000W-9511. Vacheron Constantin has introduced the final set in the series of "Les Masques" timepieces, part of Vacheron's Metiers d'Art watch collection. The first set, introduced in 2007, bore miniature reproductions inspired by primitive arts masks from China, Alaska, the Congo and Indonesia. The second set, introduced in 2008 featured reproductions inspired by art masks from Mexico, Japan, Gabon, and Papua New Guinea. The final set released this year features reproductions inspired by masks from Indonesia, China, Mexico and Gabon. The miniature masks were created by scanning the originals to get a three-dimensional image, then that prototype was given to an engraver who meticulously carved the masks to replicate the exact look of these ancient artifacts. Beginning in 2007 Vacheron Constantin planned to release the Les Masques collection as sets of four watches, one set released each year in a limited edition of 25 for 3 years. This years release is the final in the series that has made history for the pretigious brand. The timepieces were inspired from artwork found in the Barbier-Mueller collection - a collection of over 7,000 pieces which includes artwork from tribal, classical and other primitive civilizations from around the globe. Now that all the sets have been released, the collection consists of twelve watches each with a different mask with representatives from the continents of Asia, Africa, the Americas, and Oceania. Each of the exquisite sets of watches utilizes each of the 4 most luxurious case materials. The China mask is produced in 18 carat yellow gold, Indonesia is 18 carat white gold, Gabon is in 18 carat pink gold and Mexico in platinum. The miniature masks appear upon a transparent sapphire crystal, and every watch is engraved with a poem by French writer Michel Butor. Each watch features the VC 2460 G4, self-winding mechanical stamped Poinçon de Genève movement. The indications and functions are displayed in 4 windows on the case rim. Each case measures 40 mm with a sapphire case-back, and is water resistant to 30 meters. 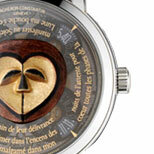 The Indonesia watch is inspired by a facial mask from the Island of Lombok and the Sasak people. This mask is made of hard wood and has traces of white pigments. The China watch is inspired by a Zangs-‘Bag facial Mask from the Tibet region, Tantric Buddhism which dates around the 16th or 17th century. It is produced from partially-gilt copper. 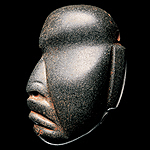 The Mexico mask is a Pendant Mask from the State of Guerrero and is produced from basalt, a common extrusive volcanic rock. 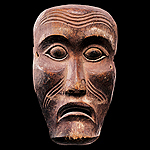 The Gabon watch is a Ngontang Mask produced by the Western Gabon, Fang people. It is a soft wood covered with white kaolin with specks of crystallization. 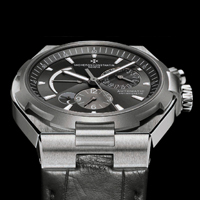 This summer Vacheron Constant has launched two new models for its Overseas collection, the Overseas Automatic and the Overseas Automatic Chronograph. These two feature a monochramtic grey theme with finely brushed stainless steel cases and anthracite titanium bezels. 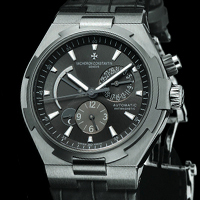 The models are re-interpretations of previous Vacheron watches produced way back in 1933 and 1977. Both of these watches feature a large 42 mm stainless steel cases and the titanium bezel shaped as a continuation of the Maltese Cross symbol that is the hallmark of the brand. Both have slate colored dials with baton shaped hands and silver wedge-shaped hour markers treated with a luminous coating for superior legibility even in low-light conditions. 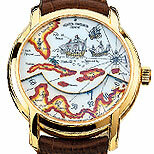 The watches feature screw-down winding crowns and screw-locked engraved case-back. The supberb structure of these models allow for water resistant up to 150 meters, equivalent to 15 ATM. The new titanium Overseas watches have an automatic movement, with the Automatic is driven by the 1226 calibre and the Automatic Chronograph by the 1137 caliber. Both are magnetically shielded. 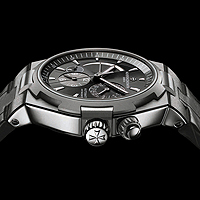 The Overseas Chronograph Caliber 1137 has a balance frequency of 21,600 vibrations per hour, a 40-hour power reserve, and measure independent intervals of time with 1/6th second precision. 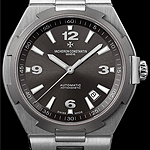 The Overseas Automatic 1226 caliber has a date display and central sweep seconds with a stop function. Both Overseas timepieces come with a grey alligator leather strap and a rubber strap. The stainless steel buckle has a triple-deployant with the Maltese Cross. Vacheron Constantin has added two new timepieces to their collection, created to pay tribute to two of histories greatest explorers - Marco Polo and Christopher Columbus. The Metiers d'Art Tribute to Great Explorers are entirely hand-crafted and are to be produced in a limited series of sixty pieces of each design. The most impressive aspect of the Tribute to Great Explorers watches are the beautiful dials, created by employing the art of 'grand feu' enameling. The two dials represent Marco Polo's journey from 1271 to 1295 across Central Asia and Christopher Columbus's journey from 1492 to 1493 from Huelva to San Salvador and his discovery of America. The references for these models are 47070/000J-9085 for the Christopher Columbus inspired watch and 47070/000J-9086 for the Marco Polo inspired watch. Both cases are 18 carat yellow gold and have a diameter of 40 mm and 12.21 mm thick. 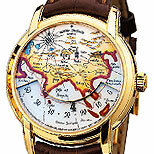 The dials are 22-carat gold two-part base with a polychrome “Grand feu” enameled decoration. They have a 1126 AT movement that is self-winding and has an additional mobile hour display with a power reserve of approximately 40 hours. The straps are hand-sewn square-scale brown alligator leather and have a folding clasp buckle in 18-carat yellow gold with the standard vacheron polished half Maltese cross. The water resistance to 30 meters. Vacheron Constantin has introduced the next in the series of "Les Masques" timepieces, part of Vacheron's Metiers d'Art watch collection. The first set, introduced in 2007, bore miniature reproductions inspired by primitive arts masks from China, Alaska, the Congo and Indonesia. The miniature masks were created by scanning the originals to get a three-dimensional image, then a prototype was given to an engraver who meticulously carved the masks to replicate the exact look of these ancient artifacts. This year Vacheron set out to outdo the beauty and attention to detail of last years models with four more exquiste reproductions, this time inspire by masks from Mexico, Japan, Gabon, and Papua New Guinea. Beginning in 2007 Vacheron Constantin planned to release the Les Masques collection as sets of four watches, one set released each year in a limited edition of 25 for 3 years. This years release is the second in the series that has been meet with much excitement. The timepieces were inspired from artwork found in the Barbier-Mueller collection - a collection of over 7,000 pieces which includes artwork from tribal, classical and other primitive civilizations from around the globe. When all the watches have been released, the collection will consist of twelve watches each with a different mask with representatives from the continents of Asia, Africa, the Americas, and Oceania. Each of the four watches to a set is produced from a different metal - yellow gold, white gold, pink gold and platinum. 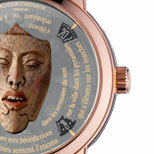 The miniature masks appear upon a transparent sapphire crystal, and each watch is engraved with a poem by French writer Michel Butor. For the 2008 models the engravers were pushed to outdo themselves and spent countless hours to ensure that the smallest detail on each mask was represented on the miniature reproductions. Particular attention was paid to the original material of the masks. When copying the clay based Mexico mask, extra time was spent to ensure that the rough aspect of the pottery's surface was reproduced. The 2008 Japan Mask was inspired from a ritual Buddha mask from the second half of 19th century. The original mask was made of lacquered wood with gilded and blue pigments. 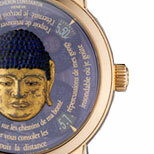 This mask is set on a yellow gold watch case with a blue dial. 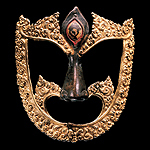 The Mexico Mask was inspired from a fragment of a mask-shaped censer from the Mayan civilisation of 550-950 AD. The fragment is ceramic and the piece is actually believed to be part of a decorated chimney. The case for the watch is made from pink gold. 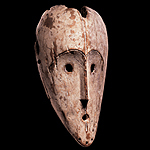 The Gabon Mask is a Pibibuze mask made by the Kwélé people. It is made from polychrome semi-hard wood and has an aged patina. The actual time of this masks creation is unknown though it was aquired before 1930. The case for this watch is made from white gold. The final mask is the Papua New Guinea Mask created from wood, pigments, and Conus sp. shells. 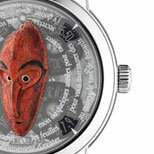 This beautiful red mask is set on a grey dial, the case of the watch is platinum. Vacheron Constantine's new line, Quai De I'ile, was named after the brand's Geneva address where they have run their business since the 19th century. The watches feature semi-transparent dials and the latest security printing technologies. These new watches are using two new unique movements from Vacheron, the calibre 2460QH and the 2475SC/1 both of which are stamped with the Geneva Hallmark. The new Quai De I'ile line will have two models, the Date Self-Winding and the Day-Date with Power Reserve Self-Winding. Both of the new models will be available in three different versions, Palladium, Pink Gold and Titanium. Each watch in the Quai De I'ile Day-Date with Power Reserve Self-Winding can be personalized to one of almost 400 possible combinations. Each watch will come with two straps, one in black or brown saddle-finish gator leather and the other in dark-brown or black vulcanised rubber.